This is a piece I'm working on~ It's not done yet, I think It's gonna be a two part project. Maybe even four parts. I've been really leaning towards ocean and nautical themes lately. Well, you know, I've always been really drawn to the ocean (even though I've been pretty deathly afraid of under ocean for a while), but I've never really done anything major in my art devoted to the sea. 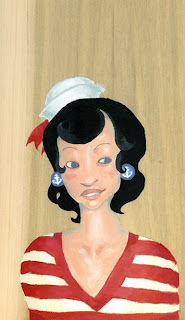 I love sailor colors and all the designs that go into boats, and ships~, and the clothes people wear on the shore. Also, it's all about the light houses, baby. I'm really excited to get started on more nautical-themed paintings and drawings. And I'm also doing a lot to get over my fear of underwater. :) I've been looking at a bunch of pictures of octopus (SERIOUSLY, the source of my phobia) and under ocean scenes. making things happen || a BFA1 in character animation student at CalArts! This is a Flickr badge showing items in a set called keep your head up. Make your own badge here.
! MY FAB FAVE !